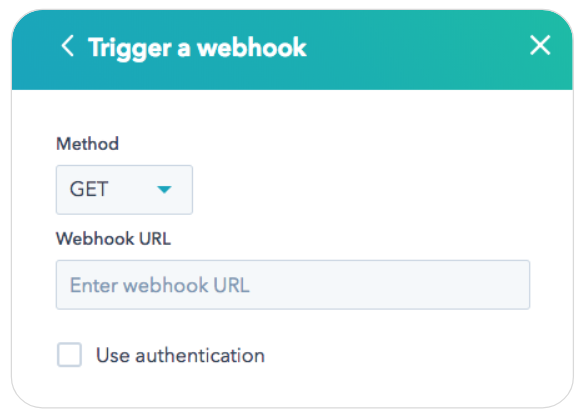 As of November 1, 2018, the "Trigger a webhook" action in workflows will be available to HubSpot Enterprise customers only. If you are a HubSpot Professional customer before that date, you will be grandfathered and will continue to have the ability to use webhooks. The latter is a squarely Enterprise use case, and moving it to that tier helps us clarify and focus what it should be used for, so we can better iterate and develop on it in the future. The vast majority of customers using webhooks in workflows are already Enterprise customers, and we believe that this will be a better way to serve their needs going forward. We are currently working on a better way to connect workflows to integrated tools. You may have heard of something we've been working on called workflow extensions. Workflow extensions allow our integrators to build custom branded actions inside of workflows, that can be configured by customers directly from the workflows tool. We've been working with a handful of Connect partners to build out some beta workflow extension actions.